We are engaged in manufacturing high-quality products. 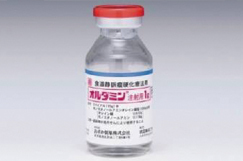 Fuji Chemical has developed various types of drugs based on the extensive experience and technology for APIs. As a result of our focused activities in exploratory research and development of orphan drugs, in 1991, we successfully commercialized the injectable form of Oldamin, which is a drug for esophageal varices that has greatly contributed to the treatment of gastrointestinal diseases.